The LL.M. team, Carlos Diaz, left, and Marshall Harkins, with coach and Professor Julian Cardenas. 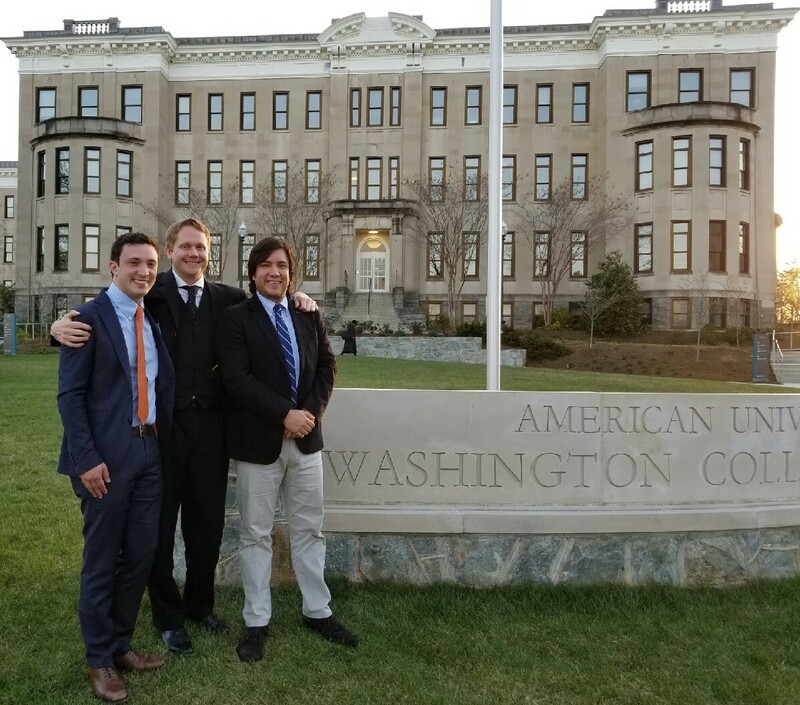 April 20, 2018 – Two teams representing the University of Houston Law Center recently advanced to elimination rounds in Investment Arbitration Moot Competitions in English and Spanish at American University Washington College of Law, in Washington D.C.
On March 15, four J.D. students from different backgrounds and national origins, including the U.S., Mexico, Ecuador and Venezuela, advanced to the finals of the V Investment Arbitration Moot Competition in Spanish against teams from Latin America and Spain. The team of Carlos Ruiz, Tania Alonzo, Danny Avila II, all third-year students, and Maria Cristina Ortegón, 2L, reached the final round after competing against the University of Mar del Plata and the University of Rosario, both of Argentina, in the elimination rounds. Ruiz was named "Best Speaker" of the competition. "Spanish is my secondary language, so it was an amazing challenge to be able to improve my Spanish legal and writing advocacy skills in an area of law I am passionate about," said Avila II. "This accomplishment demonstrates firsthand why diversity is so important in law schools. "We are also very grateful for all of the law firms that opened the doors to us and gave us invaluable advice and feedback." Members of the J.D. 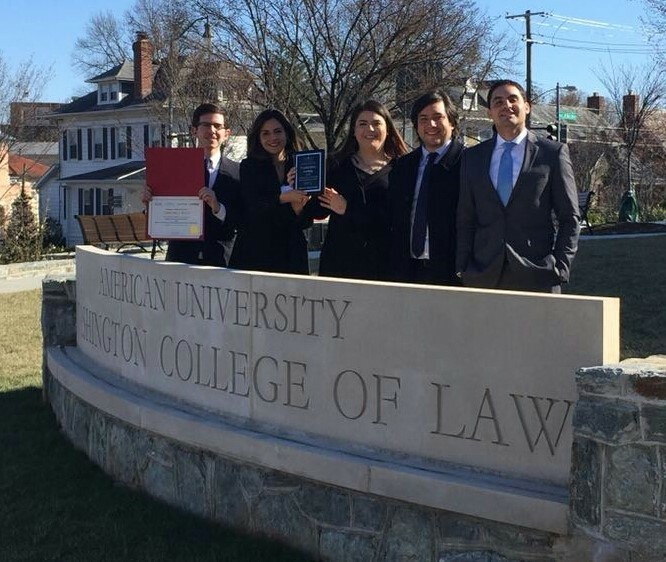 arbitration team are Carlos Ruiz, left, Tania Alonzo, Maria Cristina Ortegón, Professor Julian Cardenas and Danny Avila II. In preparation for the competition, the team ran mock hearings with Reed Smith, King and Spalding, Brigard & Urrutia, and Mariana Lozza, former legal counsel at the Argentine Treasury Department. On April 13, the LL.M. team of Carlos Diaz, a Mexican attorney enrolled in the UHLC Energy Law program, and Marshall Harkins, a barrister in England enrolled in the American Law program, advanced to the quarter finals of the VII Investment Arbitration Moot Competition. Diaz received a speaker honorable mention diploma. "Houston is a world-capital for investment arbitration practice since many companies and law firms involved in these cases have their seat in Houston," said Harkins. "We had a great experience advocating an investment arbitration case in an international context. Our success was made possible by the expert tutelage of our international faculty, Professors (Lorena) Perez-McGill and (Julian) Cardenas, and the support of the University of Houston Law Center." The cases dealt with energy and mining investment, involving issues of energy, natural resources and investment law, which are main topics of concentration at the UHLC programs. "This proves that our students are prepared for these challenging cases in their career paths serving government agencies or working at law firms involved in complex and transnational transactions," said Cardenas, a research assistant professor, who coached both teams and teaches Transnational Investment Law and Arbitration at UHLC.